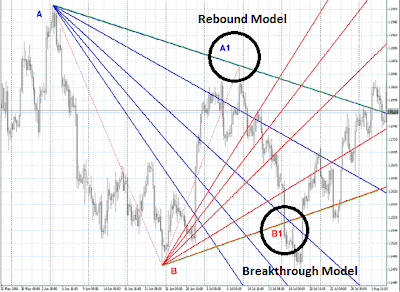 This is the second article in a 5-part series about the Metatrader 5 Fibonacci Tools. In this article we are going to customize the Fibonacci Fan settings within Metatrader 5 so it can better identify major support and resistance levels. The customized Fibonacci Fan can be used also as a powerful stand-alone trading system. There are 3 basic models of the price movement within the Fibonacci Fan levels. The price runs from the target level of the last Fibonacci Fan to the target level of current Fibonacci Fan. B1 - support level and the target level for the future fan C-C1. On the chart above you can see the Rebound model and the Breakthrough model in action. Usually, within the Bolt and Breakthrough model, the price reaches high volatility when it is reversing its course. Target Level: After the price reversal, the target is set on the target level (0,854) of the previous Fibonacci Fan ( previous wave ). If we look at current EUR/USD position, the target for the major wave will be around 1.3000 end July/begin Augustus this year. Another important instrument are the Fibonacci Arcs, with this tool we can clarify the target level within a certain time period, it is the crossing of the Fibonacci Fan's target level (0,854) with the Fibonacci Arc's 0.764 level. I'm going to write about the Fibonacci Fan & Fibonacci Arcs combination in the next article. There is a wonderful indicator that is build for Fibonacci Fan trading, Fiba +, currently it is available only for Metatrader 4. You can download it below with the indicator template. It draws the main Fibonacci Fan levels as described above and gives them priorities. Recommended time-frame for this indicator is H4. The Fibonacci Fan Mirror can be used to identify resistance levels for the current price move within the current Fibonacci Fan. For example, if the price bounces off the 0,618 level of the fan mirror, the target level of the mirror becomes a major resistance. You can also use the Fibonacci Fan Mirror for placing stop loss or lock positions ( however as we know, in Metatrader 5 it's not possible :( ), the stop loss level should be placed above the mirror's target level 0,854. I'm going to write more about this in future articles.